As I was putting my tee in the ground, a loud and assertive voice boomed over the P.A. system. "Sir... Please leave the first tee immediately. Denim shorts are not permitted!" Ugh... embarrassed much? 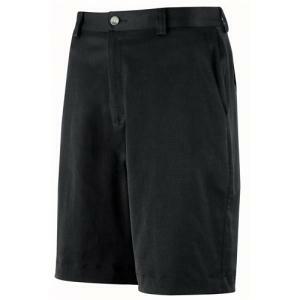 I slinked into the Pro Shop and spent $50 for some really ugly polyester shorts. Ever since, I've been a little more fashion savvy when visiting "schwanky" golf clubs. These Adidas Men's Tech Golf Shorts are more my style. Not only are they stylish, they are made of 100% quick dry twill. I like Adidas shorts because they are very lightweight and comfortable. I would wear the black if I were going for the dressier look, but I'd probably go with a lighter color on those hot days. I survived that embarrassing day out with my CEO and his golf club. I even managed to beat him -- which, come to think of it, now might have been a mistake as well. Not sure if it was the shorts or my score, but I never did get invited back. Hmmmmm.